The Holy Land of Jesus' time was totally unlike what people imagine it to have been. And it was far from being a back — ward country full of itinerant shepherds and oriental casbahs. It was a land of wealth and beauty — one of the greatest exponents of Greek culture in the ancient world. Yet all of its present and former glory fades into obscurity in the light of the prophesied preeminence the Holy Land is to have in God's Kingdom — soon to come! TODAY the land of Israel is often described as a land of contrasts. Major cities rise on what were formerly just sand dunes. Where there was once desert or swamp, one sees thriving farms today. But why the desert and swamp to begin with? Was this not the "land of milk and honey"? Today one is still staggered by the denuded slopes of the central mountain chain — they are treeless and so dry. Has it always been this way? What had happened to this land which was once the envy of the world? What was it like in the time of Christ? Most of us have associated this ancient area with camels, donkeys and people dressed in Bedouin garb. But this is nothing like it formerly was. Eyewitness reports give us an astonishingly different description. The most important witness was Josephus, the Jewish historian who lived in the first century. Williamson — who has given us one of the finest translations of Josephus — graphically sums up his overall description. He notes how Josephus brings "before our eyes the cities, palaces, and temples which filled this little land with beauty and made it one of the greatest creations of Hellenism, as different as could be imagined from the Palestine of our Sunday School memories... a country filled with such a wealth of architectural and artistic splendor as has perhaps never been elsewhere since the world began, and (subsequently) reduced by crimes and follies to a desert, a mass of shapeless ruins" (Introduction, Penguin Ed.). These two statements of Josephus' translator begin to tell us how the Holy Land really was. It was nothing like it is today! The building up of this area, making it one of the most prosperous areas in the world, was started two centuries before Christ. But the greatest activity came in the time of Herod the Great. We need to recognize the cultural advances implemented by Herod and his successors. They made this country into a showplace of Greek culture and Hellenistic splendor which turned it into a prime example of classical grandeur in the first century. Herod's accomplishments occurred just before the birth of Christ. The darker side of his life has been adequately penned by Josephus and the Gospel writers. Yet there was a trait in Herod's character which may, in one way, allow the historian to give him his common title, "the Great." The reason? He was one of the most prodigious builders of all time. His structures were never ordinary in size or common in esthetic values. No one could match Herod in his lavish outlays of resources for the building of whole cities, temples, harbors, theaters, amphitheaters, hippodromes, palaces, as well as parks, gardens, roads, etc. Not only did his building enterprises extend through his own territory, but his generosity spread throughout the Eastern Roman Empire. What he created in the three decades of his rule was such a prosperous kingdom that "its external splendor recalled the traditional magnificence of Solomon" (McClintock and Strong, Cyclopaedia of Biblical, Theological and Ecclesiastical Literature, Vol. IV, art. "Herod"). What a comparison! Herod's kingdom became much like Solomon's in its riches. But where did his wealth come from? Could the land of Herod and his surrounding domains support such extravagant building expenditures? The answer is most decidedly YES! This land was different in those days. The whole area was very prosperous. Speaking of the land in general, Josephus relates that the fruitfulness of the land made it like "a garden of God in which there grow the most precious and most beautiful trees in amazing variety." The whole area is excellent for crops or cattle and rich in forests of every kind, so that by its adaptability it invites even those least inclined to work on the land. Consequently every inch has been cultivated by the inhabitants and not a corner goes to waste. It is thickly studded with towns, and thanks to the natural abundance the innumerable villages are so densely populated that the smallest has more than 15,000 inhabitants (Josephus, Wars of the Jews, III, 3, 2). ...are made up of hills and plains, with soil easily worked and repaying cultivation. They are well wooded and prolific in fruit, both wild and cultivated; for nowhere is the soil arid by nature and rain is generally ample. All their streams are remarkably sweet, and lush grass is so plentiful that the milk-yield of their cows is exceptionally heavy. The final proof of their outstanding productivity is the swarming populations of Judaea and Samaria (ibid., para. 4). Ambassador College Photo — A view of the Sea of Galilee from its surrounding hills — green and productive as in the days of Josephus. Where did Herod get his abundance of wealth which became proverbial throughout the Roman world? It came from the land and from the productive people that lived on it. In the time of Christ, it was one of the wealthiest areas in the whole Roman Empire! All people of the time knew it. Josephus admitted that "of all the cities under Roman rule, our own (Jerusalem) reached the highest summit of prosperity" (Wars of the Jews, Preface, 4). It can easily be demonstrated why it became so prosperous. Other areas of the Roman Empire (other than certain regions of Asia Minor, Syria and Egypt) were no match for wealth. Vast tracts in Italy — the very heartland of the Empire — were veritable wastelands created by the Hannibalic, Social and Civil Wars. Greece was in shambles — not even a facade of its former self. Spain and Gaul were undeveloped. It was the East that carried the financial burden of the Empire, and proportionately it was the Herodian region that led most others. Even Titus, the later Roman Emperor, stated that the land of Herod "had become richer than Rome itself" (Josephus, Wars of the Jews, VII, 1, 2). Herod was a great Hellenist — a great exponent of classical Greek culture. His buildings had the stamp of classical Greece all over them. The cities he built were not like the typical ones found in the Middle East today. They were thoroughly "Greek" with many special embellishments created by Herod himself. The guiding principle which motivated Herod and his architects was to make things bigger and better than any other in existence. Splendor was the keynote. 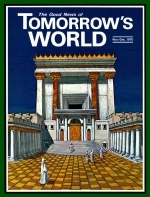 One of his monumental buildings, which the people of the Roman world admitted to be the most impressive structure on earth, was the Temple which Herod rebuilt on Mount Moriah in Jerusalem. With all its magnificence, scope, grandeur — gold, rare woods, lavish marble decorations and colossal walls — no building of the twentieth century could begin to compare with it. Herod built the Temple to be one of his crowning achievements — and so it was. It took over 70 years to complete. But strangely, it was finished about 6 years before it was destroyed by the Romans. All that remains today is some of its platform on which the outer courts of the Temple stood, and part of its walls (the famous western — or "Wailing" Wall). The Temple was an immense structure. It was built on a gigantic stone platform with walls on all sides. These surrounding walls were about a mile in length, 200 feet high and in some places 18 feet thick. Josephus said that "the wall was itself the most prodigious work that was ever heard of by man" (Antiquities of the Jews, XV, 11, 3). Surrounding the Temple enclosure and abutting to the inside of its massive walls was a covered arcade or walkway 45 feet wide and supported by Corinthian columns. Each of the columns — about a thousand in number — was made of single stones, circular in shape, with Corinthian capitals decorated in gold. The ceiling of this arcade was paneled with cedar. "The natural magnificence of it all, the perfect polish, the accurate jointing," said Josephus, "afforded a remarkable spectacle." But beside the colossal walls and arcade, there was the sanctuary itself near the center of the platform. The sanctuary was made of the finest marble and was the height of a ten-story building. All its gates were covered with gold and its many decorations were of the best workmanship imaginable. The Sanctuary had everything that could amaze either mind or eyes. Overlaid all around with stout plates of gold, in the first rays of the sun it reflected so fierce a blaze of fire that those who endeavored to look at it were forced to turn away as if they had looked straight at the sun. To strangers as they approached it seemed in the distance like a mountain covered with snow; for any part not covered with gold was dazzling white (Wars, V, 5, 6). The present archaeological excavation at the southwestern angle of the ancient Temple walls — an excavation sponsored jointly by Hebrew University and Ambassador College (see pictures on page 44) — is uncovering some of the relics associated with this fabulous structure. The archaeologists on the "dig" keep remarking about the sheer majesty and glory of these remains. Herod did nothing in a small way. As an example, the "dig" has been excavating the foundations of piers that supported the largest bridge ever constructed in the Roman Empire — a bridge so enormous that a modern superhighway could be placed on top quite easily. There was certainly nothing common about Herod's building enterprises. An example of this is another building which almost took the breath away to view it. This was the palace which Herod built for himself in Jerusalem. It was so splendid that Josephus said no tongue could possibly describe it. Leaving aside Herod's own beautiful quarters, this magnificent palace contained immense banqueting halls and quite a number of guestrooms, each having spaces for 100 beds. All the stones of the floors were of different colors — stones that everywhere else were looked on as rare were found in Herod's palace in great profusion. No two of the many rooms were designed alike, and they were all luxuriously furnished mostly with gold and silver. And adjacent to the many rooms were open spaces of green lawns surrounded by columned arcades. There were all kinds of trees along the walkways and these were flanked by watercourses and pools adorned with bronze statues through which water poured out. Josephus said this palace was so wonderful that it almost made the Temple itself seem insignificant. But there were many marvelous structures that made Jerusalem one of the most beautiful cities on earth — buildings which put ancient Athens, Rome and Alexandria in the shade. Right next to the Temple, Herod built one of the largest citadels in the East. It was described as being more like a sumptuous castle or palace than a fortress. Then there was the amphitheater, which looked much like the later coliseum built in Rome. To this amphitheater were brought many wild animals, great quantities of lions, and other beasts which were rarely seen in the Roman Empire. These beasts fought either one another or men in gladiatorial fights. Herod also built in Jerusalem a Greek theater as well as a hippodrome (where chariot and horse races, gymnastics and athletic events were held in imitation of the Olympic Games). Besides all this and numerous other buildings of elegance, there were public parks, many fountains, pools and extensive gardens found throughout Jerusalem. On the cultural side, Herod surrounded himself with a circle of men accomplished in Greek literature and art. The highest offices of state were entrusted to Greek rhetoricians. Scholars and professional men came from all over the Empire to take advantage of Herod's generosity in the liberal arts and natural sciences. Herod was so infatuated by the Greek way of life that he even boasted of being more nearly related to the Greeks than to the Jews. In short, there was hardly a Hellenistic city anywhere in the world that could compare in grandeur to the city of Jerusalem in the time of Jesus. The Holy Land was dotted with cities and towns based on Greek architectural designs. Herod beautified a new Jericho — constructing in the city a palace and a fortress. He also gave the inhabitants a theater, amphitheater and hippodrome, plus a good number of public buildings. At Paneum, near the source of the Jordan River (the Caesarea Philippi of the New Testament), he constructed a great temple to Caesar of the finest stones available. Then about 10 miles south of Jerusalem he raised up an artificial mountain more than 300 feet high and on top constructed a fortress so magnificent that it is described as being more of a palace than a citadel. He also fortified lavishly the famous Masada, and sites east of Jordan. But even these things did not contain Herod's ambitions for building. Selecting a spot on the Mediterranean Sea where there was a small town in the state of decay, he decided to build — with tremendous natural odds against him — a brand new city and harbor. Spending a vast amount of money, he first lowered into the water gigantic rectangular stones to form a breakwater. Most of the stones were 50 feet long, 9 feet deep and 10 feet broad. Beginning from the shore he continued this breakwater out into the Mediterranean in a circular fashion until some of the stones were being lowered into 120 feet of water. After bringing this breakwater to the surface, he then built a mole on top which was 200 feet wide. On this were erected many buildings for seamen and fishermen. Opposite this artificial harbor which he had now created, he built a temple to Caesar with a statue of the emperor so large (it was over 40 feet high) that it matched the Olympian Zeus — one of the Seven Wonders of the World. The rest of the buildings and statues of this new city were of the largest scale — many other works in the Roman Empire being dwarfed by comparison. Because this new city was one of the greatest creations of the time, Herod named it after Caesar, calling it Caesarea. The city is mentioned in Acts 10:1. This, however, was not all. The old city of Samaria in the hill country of Ephraim was completely reconstructed on a scale almost equaling Caesarea. Herod also built two complete cities near Jericho. Then he rebuilt the coastal city of Anthedon, which had been destroyed in war, with his customary grandeur. And we must not forget the great commercial city of Antipatris which he raised up in the Plains of Sharon. I cannot think of any suitable spot in his kingdom that he left without some tribute of esteem for Caesar. When he had filled his own country with temples, these tributes overflowed into his provinces, and in city after city he erected a Caesareum (a temple to Caesar) (Wars, I, 21, 1-8). But there was more. Not only were Herod's provinces so rich that he made his kingdom the showplace of the world, he also showered his generosity on many far-flung cities and areas. And then, as though this were not enough, he was able to help one of the greatest cities of the East — Antioch. That city did not have enough money to pave even its principal street. But what did Herod do? He paved 2¼ miles of it with the finest polished stone available. And to secure his fame in that city he built an arcade over the street supported by sumptuous Corinthian columns from end to end. This was to keep the rain off the people using this creation of Herod's. And when the Olympic Games in Greece were in danger of ceasing because of a lack of funds, Herod donated such a gift of money for their upkeep that the committee made him president of the Games. And to perpetuate the memory of this honor, he "endowed them for all time with an income big enough to ensure that this presidency would never be forgotten" (ibid.). As for his other benefits [to various nations], it is impossible to reckon them up, those which he bestowed on cities, both in Syria and Greece, and in all the places he came to in his voyages (Antiquities, XVI, 5, 3). There can be no doubt, Herod's kingdom was one of the richest in the Roman Empire. As Josephus said, the Holy Land had reached "the summit of prosperity." This land in the time of Christ was the jewel of the East. Its buildings were so beautiful, its fortresses so strong, its financial capacity so great, that no one would have imagined that all of it would be reduced to ashes and complete ruin within a generation. But there was someone who knew. That person was Jesus Christ! Not long before His crucifixion, Jesus climbed to the summit of the Mount of Olives overlooking Jerusalem on the east. When His disciples called attention to the grandeur of the Temple and the city, He answered, "Seest thou these great buildings? There shall not be left one stone upon another that shall not be thrown down" (Mark 13:2). Who could have believed such a prophecy? The most prosperous area in the Empire being reduced to oblivion? This seemed absurd and beyond belief! But this is what Christ prophesied, and within a generation it had come true — so true. Christ had said that "when ye shall see Jerusalem compassed with armies, then know that the DESOLATION thereof is nigh" (Luke 21:20). Ambassador College Photos left, above: courtesy of Hebrew University — Opposite are some views of the Mount of Olives: (top] an olive tree on the Mount, and (bottom) looking at it from across the Kidron Valley on the Temple Mount. In Herod's time the hillside was covered with gardens and olive trees. Above are shots of typical ruins found in the many archaeological excavations in Israel. The countryside like the City was a pitiful sight; for where once there had been a lovely vista of woods and parks there was now nothing but DESERT and the stumps of trees. No one — not even a foreigner —who had seen the old Judaea and the glorious suburbs of the City, and now set his eyes on her present desolation, could have helped sighing and groaning at so terrible a change; for every trace of beauty had been blotted out by the war, and nobody who had known it in the past and came upon it suddenly would have recognized the place (Wars, VI, 1, 1). The Romans took away to various parts of the Empire much of the remaining people and also carted away many of the beautiful stones and other fineries that made up this once-glorious land. It has been said that if the ruins of these Herodian cities, buildings and temples had been left rather than taken away, classical admirers would not be going to Greece or Western Asia Minor to see the remains of the Hellenistic world. They would be coming to Jerusalem and the surrounding area. But almost all of it was taken away over the decades that followed the disastrous Roman-Jewish War. And of the Temple building itself, not one stone remains upon another. With that war, the external splendor of the Holy Land — a glory that approached that of Solomon's, completely disappeared. The Roman-Jewish War began its decline. The wars that came in its wake, over the centuries, have further reduced it to the state that it is in now. But has his glorious land of Christ's time with is beauty and prosperity been banished forever? The time is soon coming when the Holy Land will regain its prosperity — and even on a grander scale than the times of Solomon and Herod put together! The prophet Joel said that the Lord will "be jealous for his land, and pity his people.... I will send you corn, and wine, and oil, and ye shall be satisfied therewith... for the pastures of the wilderness do spring, for the tree beareth her fruit, the fig tree and the vine do yield their strength... the floors shall be full of wheat, and the vats shall overflow with wine and oil... ye shall eat in plenty, and be satisfied, and praise the name of the Lord your God, that hath dealt wondrously with you.... And it shall come to pass in that day, that the mountains shall drop down new wine, and the hills shall Flow with milk, and all the rivers of Judah shall flow with waters" (Joel 2:18, 19, 22, 24, 26; 3:18). A start in this direction is already being made. Reforestation has started in many areas. Cities are becoming more modern and areas are being cleaned up and beautified. Even the Hebrew University and Ambassador College archaeological dig is helping to clear the debris that has covered Zion for the past nineteen hundred years. God has started the rejuvenation already. Yet the complete fulfillment of Joel's prophecy will come when Gods' true Messiah, Jesus Christ, returns to this earth. This is when the area will return to its pristine glory — becoming again a land of milk and honey, the true Promised Land of God. It will then become the center of the earth — politically, culturally, economically and spiritually. The glory of the Holy Land will return, but on a much grander scale. God speed that day.